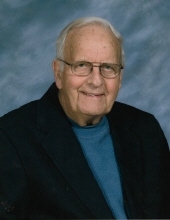 Russell Joseph Bachman, age 90 of Lanesville, Ind., passed away peacefully surrounded by his family on Friday, Sept. 21, 2018, at Harrison Springs Health Campus in Corydon, Indiana. Russell was born March 22, 1928, in Lanesville, to the late Joseph Henry and Catherine Martha Ehalt Bachman. Russell was a 1946 graduate of Lanesville High School and Coyne Electrical School in Chicago. He was a lifelong member of St. Mary’s Catholic Church in Lanesville. Russell married the love of his life, Cecilia Baines, in 1950 after meeting her at Peerless Electronic Supplies in Louisville while working as an appliance and electronic repair technician for Crowder Furniture. Russell retired from Corydon Stone and Asphalt (formerly Corydon Crushed Stone & Lime Co. Inc.) in 1993 where he was the owner and CEO. Russell joined the firm with his father in 1958 and erected one of the first asphalt plants in Southern Indiana in 1963, establishing asphalt paving for the area. He was directly involved with providing stone and asphalt for much of the major growth of roads and buildings including the construction of I-64. He was a member of many associations related to the stone and asphalt industry. He was an active regional council member for the Boy Scouts of America. He was a CCD instructor for St. Mary’s Church and a member of the Church Finance Committee for many years. He was a premier and past director for the former Old Capital Bank & Trust in Corydon as well as NBD and INB. He is a Fourth Degree member of the Knights of Columbus, Council 1808, Lanesville, and has been an All American member of the John Purdue Club since 1985. Russell was a peaceful, hard-working man, a devoted husband and caring, nurturing father. He was an avid fan of Purdue University sports and the Indianapolis Colts. He loved the Metropolitan Opera, reading, music and poetry. He was an ardent fan of all things related to classic movies. Up until last year, Russell was still driving to Lafayette and enjoyed mowing the seven acres of his plantation where he gardened, kept bees and tried his hand at woodworking in his retirement. Russell always enjoyed a good road trip, traveling to many parts of the United States and Canada, including Acadia National Forest, Niagara Falls, Beaver Island, San Antonio, California and Montana with family members. He said that in retirement he wanted to “try a little bit of everything,” and he certainly accomplished that. He will be greeted in heaven by his wife, his parents and sons Tony Bachman and Bernie Bachman. Russell leaves to cherish his memory his five daughters, Rose Marie Rogers (Jim) of Corydon, Elaine Bachman of New Albany, Miriam Robertson (David) of Depauw, Grace Anne Engleman (Mike) of Georgetown and Connie Terry (Dave) of Columbus, Ohio; his two sons, Marty Bachman (Jessica) of Georgetown and Hank Bachman (Debbie) of Eldersburg, Md. ; daughter-in-law, Sherrie Bachman of Corydon; sister, Mary Sue Renn (Louie) of New Albany; 22 grandchildren; 18 great-grandchildren; and cousins, nieces and nephews. The funeral will be at 11 a.m. on Monday, Oct. 1, 2018, at St. Mary’s Catholic Church in Lanesville with burial in St. Mary’s cemetery. Visitation will be from 1 to 8 p.m. Sunday, Sept. 30, and 9:30 to 10:30 a.m. on Monday at Gehlbach & Royse Funeral Home in Corydon. Memorial contributions can be made to St. Mary’s Catholic Church, Lanesville, and the American Cancer Society. To send flowers or a remembrance gift to the family of Russell J. Bachman, please visit our Tribute Store. "Email Address" would like to share the life celebration of Russell J. Bachman. Click on the "link" to go to share a favorite memory or leave a condolence message for the family.